Adjoining the former Anodising and Plating Shop were a number rooms were trichloroethene was utilised for degreasing purposes. Site investigation indicated the presence of elevated levels of trichloroethene (and associated daughter products) in both the soil and groundwater. One borehole down gradient of the former degreasing shop indicated levels of 87,000ug/l trichloroethene in the groundwater. The extent of the chlorinated hydrocarbon contamination within the vicinity of former Degreasing Room Area was delineated by carrying out a series of trial pits excavations around the periphery of the area to determine the lateral / vertical extent of the contamination. Envirotreat used a hand held PID meter to rapidly establish soil contamination levels and to assess / monitor VOC vapour concentrations during the remediation works. permeability Rutland Formation (blue clay layer), coinciding with the groundwater level on the site. 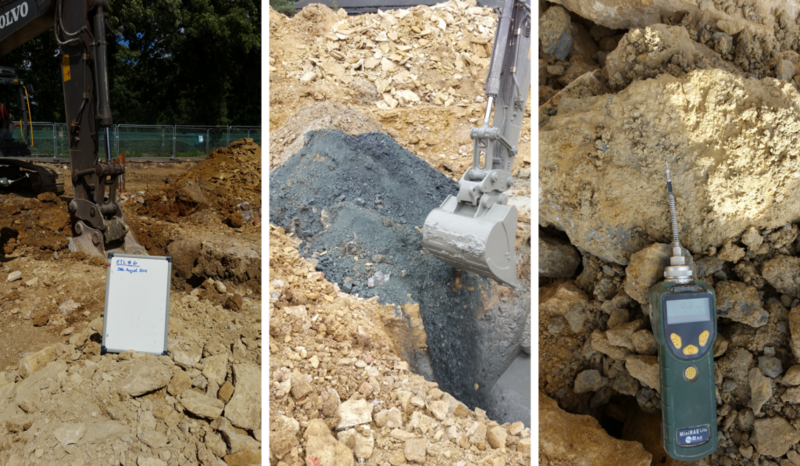 Based on the depth of the contamination and the close proximity of the source to the existing building(s), it was decided that an in-situ treatment approach would be the most effective methodology for the remediation.